Halong Bay_ one of 25 top destinations of the world for kayaking. 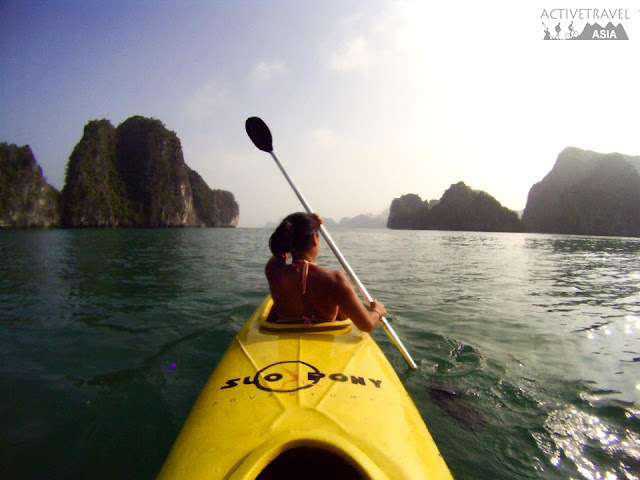 In 2002, National Geographic Adventures Journal News voted Ha Long Bay one of 25 top destinations of the world for kayaking. Kayaking is considered the best way to fully feel the majesty of Ha Long Bay and discover the cliffs with a huge number of wonderful rock tops, dales. 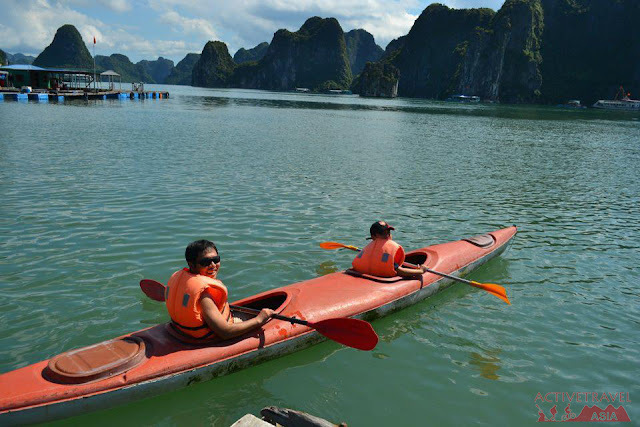 Although kayaking has been in Ha Long Bay since early 90s of 20th century, at first this kind of sport was mainly for the foreign visitors who like adventures. 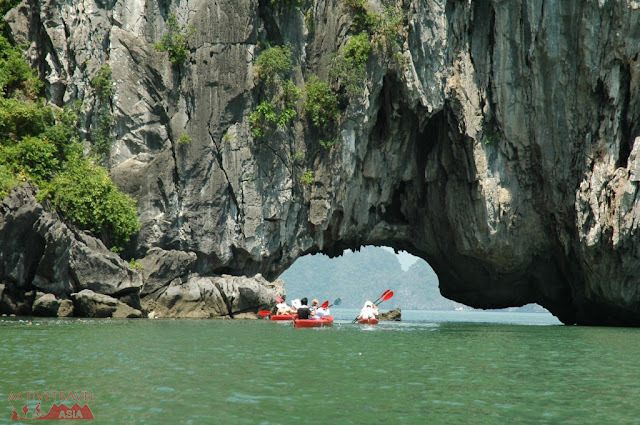 Nowadays, there are many interior guests enjoy kayaking in Ha Long Bay, especially young people. Discovering Ha Long Bay by kayaking, visitors can feel other beauty of this international wonder that can’t be seen from the cruises. Kayakers will be surprised with many cliffs which have been acted upon by the waves for centuries, contemplate the sea birds standing tottery on the top of rocks and touch the stalactites which are thousands of years old. Kayaking alone or with a partner, visitors will discover different emotions which they have never felt before when riding the oars closely to the bottom of rock mountains and enjoying the extremely quietness of the bay. When the kayak crowds into the unnamed islands, visitors can directly contemplate the beauties of corals, flocks of freely-swimming fishes and many many strange sceneries which have never been seen in any travelling books. Whenever the oars are moved down or up, thousands of water drops radiate the sparkling beauty under the sunshine. Sometimes in the short caves, visitors must lay on the kayak as well as using hands to push to the cave ceiling to go inside. They also have to walk and pull the boat when passing the dry parts. Especially, taking part in the night tour on the bay, visitors can enjoy the quite air among the sea. On the way back from a Ha Long Bay travel tour, Brian James – an Australia visitor excitedly tells about his interesting memories of the tour, especially the time when he lonely kayaking to discover Luon cave: “I was impressed the most when riding the kayak into the cave. The far I went inside, the darker it is; hundreds of stalactites hang down cross my face, sometimes I had to lay face onto the boat in order to pass. The feeling when hands were weary after finishing the Ha Long Bay discovering tour by kayaking made me very interested. 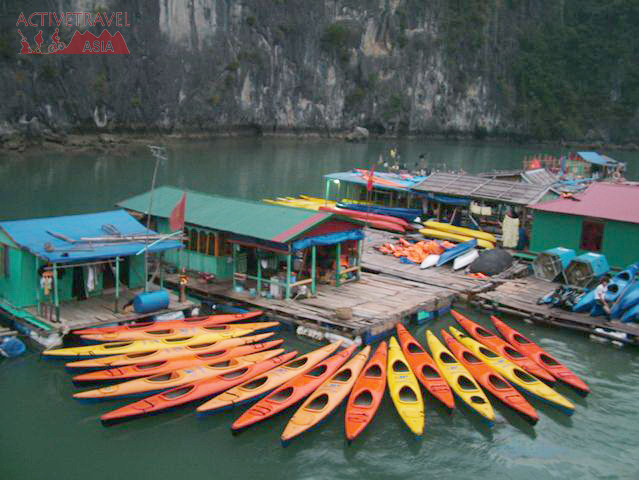 Kayaking is the best idea to discover every part of Halong for getting an insight to indigenous people life, to taste every corner of mystery lagoon, to gain surreal feeling throughout the dark tunnels.